Vertical drops juxtaposed with waterfront views make skiing amazing at Gunstock Mountain Resort. Many veterans who have skied New England and the ski mountains in the West agree that Gunstock rivals any of them. From the summit, New Hampshire’s showpiece Lake Winnipesaukee is revealed in all her frozen beauty. Glade and above-treeline runs continue to be sought after options for skiers and boarders looking for terrain beyond the marked trails and maddening crowds. This is often where superior powder can be found... when nature chooses to cooperate, of course. These might be open slopes, runs that are studded with graceful birch trees and plenty of room for turns, or snaky trails where the placement of trees determines where you get to go. 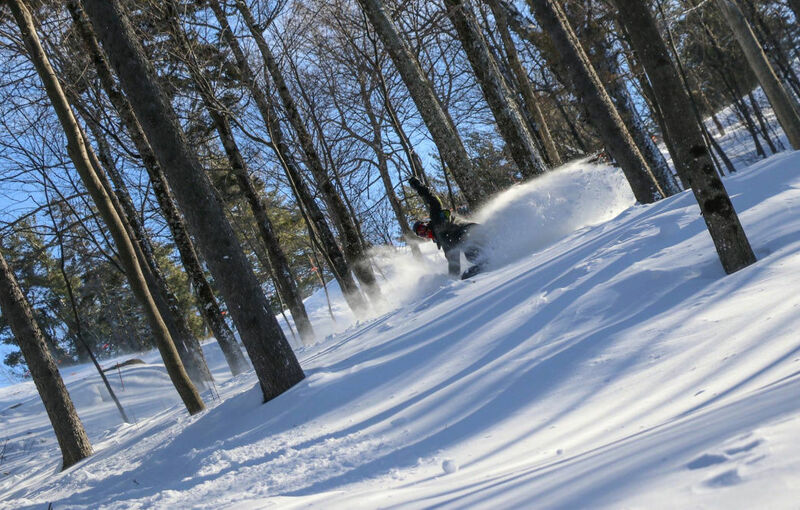 While not as abundant as they are at some of the more well-known resorts to the north and east, Gunstock still has a handful of glades—with more planned in the future. These are open when the availability of natural snow permits (like the winter of 2014-15 provided). 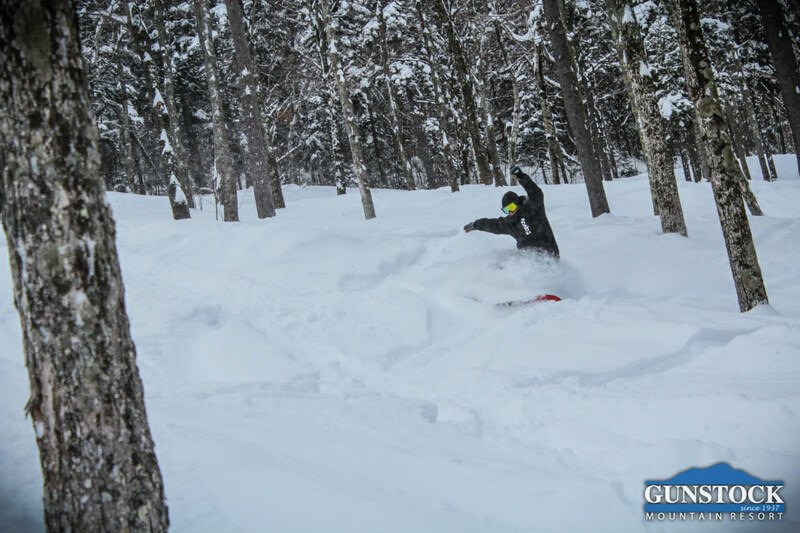 Gunstock’s four glade trail options for open, deep powder skiing are varied. 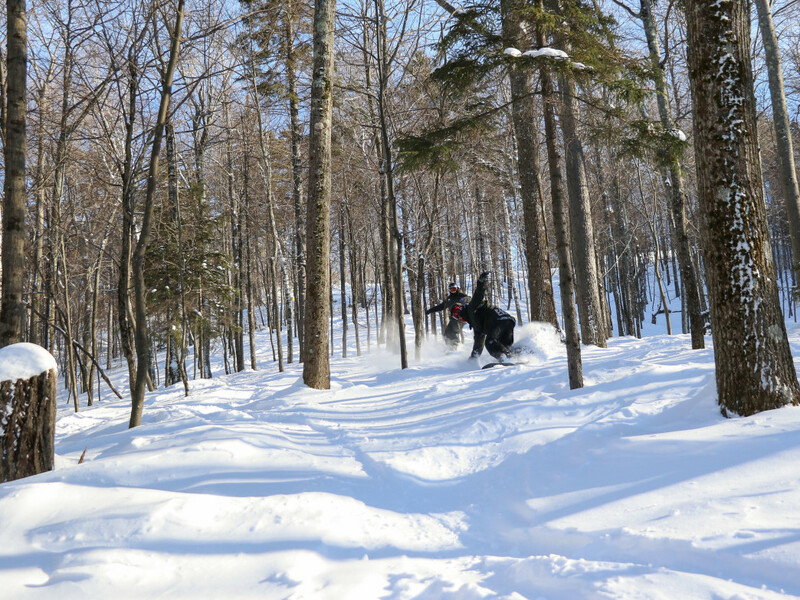 Parallax allows you to get out into the birch and pines and off the heavily-skied trails on the mountain. 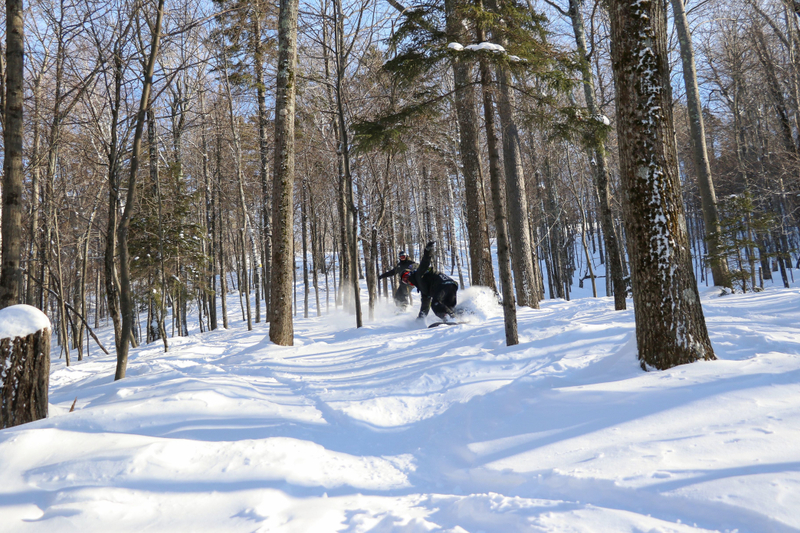 The Recoil Glades can be reached by following Upper Recoil from the peak; the trail is shielded from the wind, and the tree cover (minus their leaves) allow natural snow to accumulate. Gunpowder is a double-diamond trail, a rarity on a mountain that is mainly intermediate-level in difficulty. If Nordic skiing is your thing, the Gunstock Mountain Resort XC provides a full-service cross-country and snowshoe hub right on the mountain. With 50 kilometers of track-set, skate, and backcountry trails, levels run the gamut from beginners through advanced Nordic practitioners. Singletrack snowshoe trails are available to take you deep into the woods nearby, and their Saturday night snowshoe hikes remain popular with resort-goers. The center has ski touring equipment to rent, as well as private instruction. They even provide pulk sleds to carry babies and toddlers. These are easily pulled along by a skier. For something totally different, how about trying skijoring? Hands-free skiing harnessed to your dog! Lessons are available. If you want to test your off-the-grid backcountry skills, the Belknap Range (the range Gunstock Mountain is part of) might be the place to go. This is a rugged 11.7 mile point-to-point trail located near Gilford that is considered difficult and is used year-round by hikers, cross-country ski aficionados, and snowshoers. If driving an hour isn’t an issue, Mount Cardigan, or “Old Baldy,” as it’s sometimes called, is a hilly network of trails geared to intermediate or better backcountry skiers. From Meredith, pick up NH-104 and it’s a straight shot west. Directions are available at the Appalachian Mountain Club website. Winter outdoor adventures require precautions. Always remember that winter trail conditions can change rapidly. When off-resort, it’s best to plan ahead and be prepared. Whether on skis or snowshoes, keep in mind that weather, temperature changes, and less daylight are all things to plan for. Higher elevations require certain equipment. Snowshoes with crampons or skins for backcountry skis are required. Water, some energy snacks, a guidebook (like one of the AMC guide books), map, matches or lighter, and a flashlight with extra batteries are essentials for your pack. Make sure someone knows your plans and when you are expected back. For something in-between the resort experience of Gunstock and the demanding Belknap Range Trail and Mount Cardigan, Wolfeboro XC serves up 30 kilometers of ungroomed backcountry skiing in and around Wolfeboro, many of which takes you near the eastern shores of the frozen Lake Winnipesaukee. Perhaps most enticing of all for winter sports enthusiasts is the fact that Wolfeboro regularly receives more than 100 inches of snow. In the winter of 2014-2015, for example, it received 102. Also in Wolfeboro is the Abenaki Ski Area, the oldest small ski area in the country and one of the 10 oldest overall. It offers both downhill and Nordic skiing, including a 30 kilometer network with snowmaking capability. Given Gunstock’s accessibility, some glade skiing options, and a host of choices tending to the Nordic side of skiing, Gunstock Mountain Resort has a lot to offer. And if you are feeling adventurous and up for some backcountry skiing or snowshoeing, there are some great places to try not too far from where you’ll be staying.